The other day I ate at McDonald’s. As I was standing in line, ready to be served a free smile, I saw that someone had put up on the wall the nutritional information poster. From far away I saw the little columns of data, all in neatly organized tabular form, and a light went on over my head. I got excited like the nerd I am. Look! Out in the real world! Neatly organized data just ready to be analyzed! Amazing! 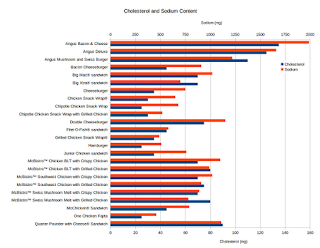 So, of course, after finishing my combo #1 and doing my part to contribute to the destruction of the rain forest, the world’s increasingly worrying garbage problem, and the continuing erosion of my state of health, I rushed right home to download the nutritional information from Ronald McDonald’s website and dive into the data. Forgive me, but we’re not doing any particularly heavy lifting here. And hey, at least it wasn’t in that one piece of software that everybody hates. Also, by way of a disclaimer, I am not a nutritionist and the content of this article is in no way associated with McDonald’s restaurants or Health Canada. First things first. Surprisingly, the largest and fattiest of the items on the board is (what I consider to be) one the “fringe” menu items: the Angus Deluxe Burger. Seriously, does anybody really ever order this thing? Wasn’t it just something the guys in the marketing department came up to recover market share from Harvey’s? But I digress. Weighing in at just a gram shy of 300, 47 of which come from fat (of which 17 are saturated) this is probably not something you should eat every day, given that it has 780 calories. Using a ballpark figure of 2000 calories a day for a healthy adult, eating just the burger alone would make up almost 40% of your daily caloric intake. Unsurprisingly, the value menu burgers are not as bad in terms of calories and fat, due to their smaller size. This is also the case for the chicken snack wraps and fajita. 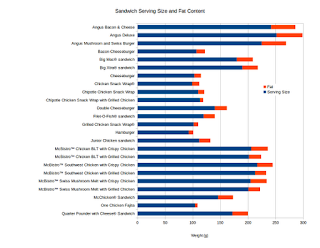 The McBistro sandwiches, though they are chicken, are on par with the other larger burgers (Big Mac and Big Xtra) in terms of serving size and fat content, so as far as McD’s is concerned choosing a chicken sandwich is not really a healthier option over beef (this is also the case for the caloric content). 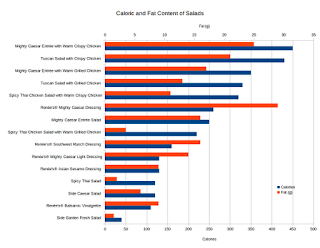 As the document on the McDonald’s website is a little dated, some newer, more popular menu items are missing from the data set. 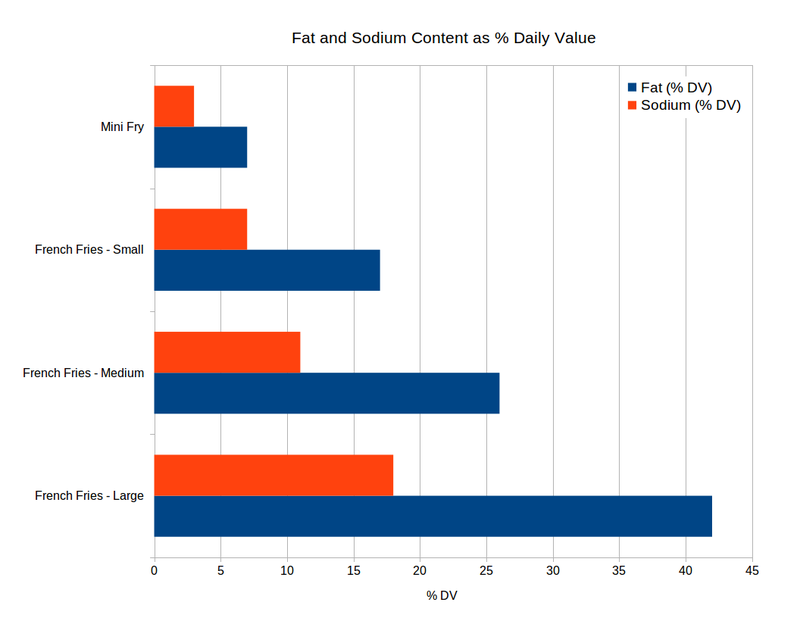 However these are available in the web site’s nutritional calculator (which unfortunately is in Flash). FYI the Double Big Mac has 700 calories and weighs 268 grams, 40 of which come from fat (17 saturated). Close, but still not as bad as the Angus Deluxe. In terms of sodium and cholesterol, again our friend the Angus burger is the worst offender, this time the Angus with Bacon & Cheese, having both the most sodium and cholesterol of any burger on the menu. With a whopping 1990 mg of sodium, or approximately 80% of Health Canada’s recommended daily intake, that’s a salty burger. Here a couple of the smaller burgers are quite bad, the Double Cheeseburger and Quarter Pounder with Cheese both having marginally more sodium than the Big Mac as well as more cholesterol. Best stick with the snack wraps or the other value menu burgers. Compared to the burgers, the fries don’t even really seem all that bad. Still, if you order a large, you’re getting over 40% of your recommended daily fat intake. I realize I’m using different units than before here, so for your reference the large fries have 560 calories, 27 grams of fat and 430 mg of sodium. If you are trying to be health-conscious, the worst drinks you could possibly order at McDonald’s are the milkshakes. Our big winner in the drinks department is the large Chocolate Banana Triple Thick Milkshake®. With a serving size of 698g (~1.5 lbs), this delicious shake has over 1000 calories and nearly 30 grams of fat. In fact the milkshakes are, without question, the most caloric of all the drinks available, and are only exceeded in sugar content by some of the large soft drinks. 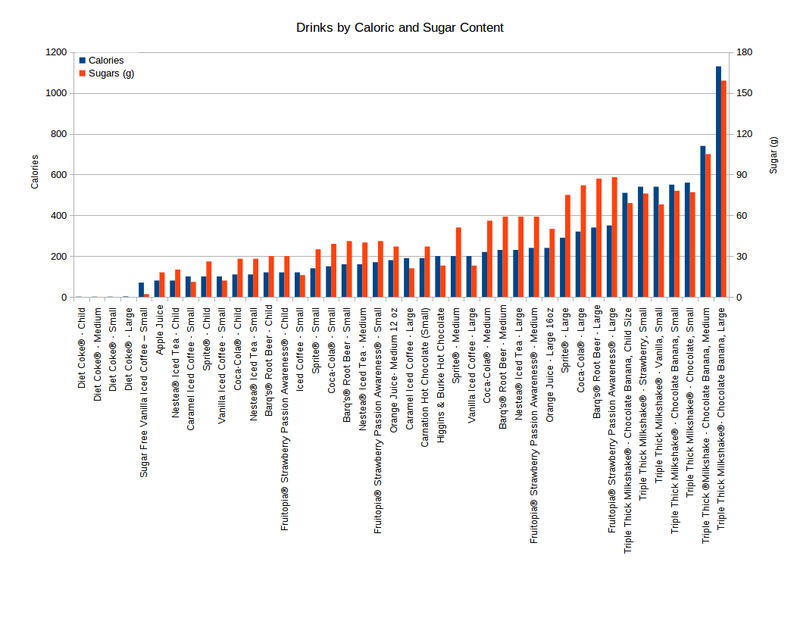 In terms of watching the calories and sugar, diet drinks are your friend as they have zero calories and no sugar. Below is the caloric and sugar content of the drinks available, sorted in ascending order of caloric content. 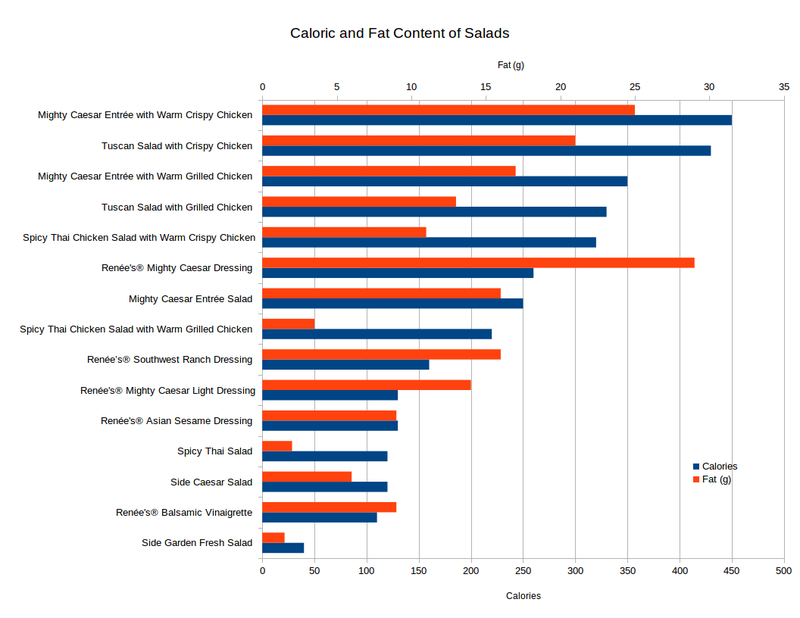 And now the big question – McDonald’s salads: a more conscientious choice, or another nutritional offender masquerading as a healthy alternative? There are quite healthy alternatives in the salad department. Assuming you’re not going to order the Side Garden Salad (which I assume is just lettuce, looking at its caloric and fat content) the Spicy Thai Salad and Spicy Thai with Grilled Chicken are actually quite reasonable, though the latter has a large amount of sodium (520 mg), and all the Thai and Tuscan salads have a lot of sugar (19 and 16 grams of sugar respectively). However, all these values are referring to the salads sans dressing. If you’re like me (and most other human beings) you probably put dressing on your salad. The Spicy Thai Salad with the Asian Sesame Dressing added might still be considered within the realm of the healthy – totaling 250 calories and 11 grams of fat. However, keep in mind that would also have 530 mg of sodium (about a quarter of the recommended daily intake) and 29 grams of sugar. Not exactly health food, but not the worst thing you could order. And for the love of god, just don’t order any old salad at McD’s and think you are making a healthy alternative choice. 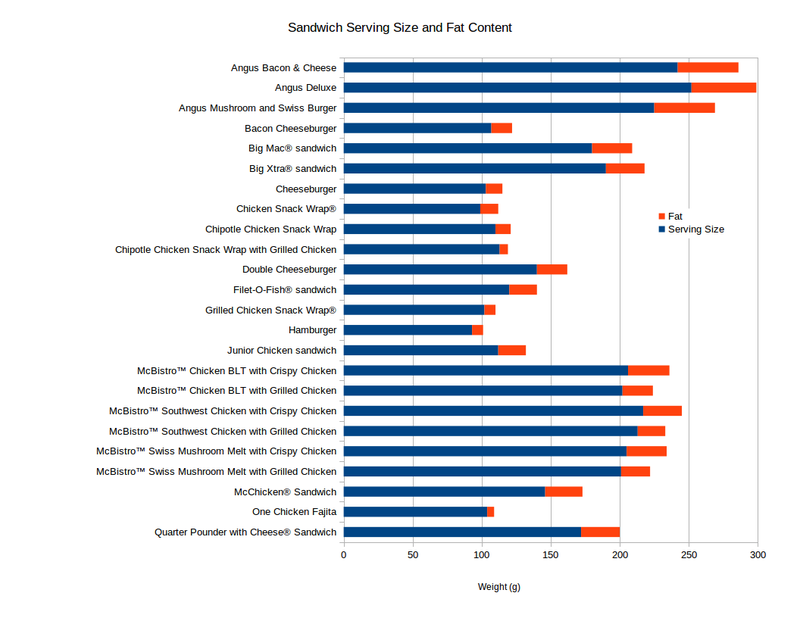 The Mighty Caesar with Crispy Chicken and Caesar dressing has more fat than a Big Mac combo with medium fries and a Coke (54 g vs. 46 g) and nearly as much sodium (1240 mg vs. 1300 mg), over half the daily recommended intake. Doing this brief simple examination of the McDonald’s menu will definitely help me be more mindful about the food the next time I choose to eat there. 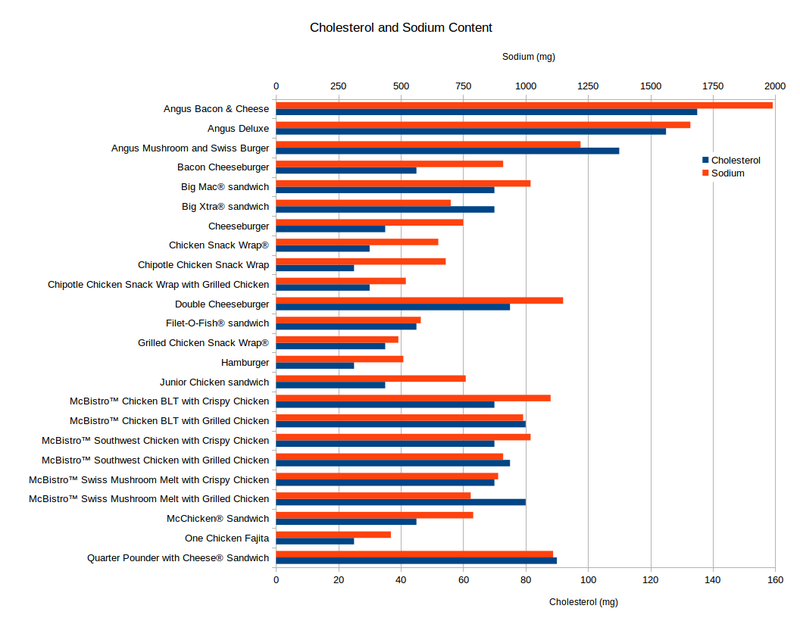 However in terms of of take-aways, there is nothing here really too surprising – we can see that McDonald’s food is, in general, very high in calories, fat, sugar and sodium. This is probably not a surprise for most, as many continue to eat it while being aware of these facts, myself included. Still, it is somewhat shocking to see it all quantified and laid out in this fashion. A Big Mac meal with a medium fries and medium coke, for instance, has 1120 calories, 46 grams of fat, 1300 mg of sodium and 65 grams of sugar. Yikes. 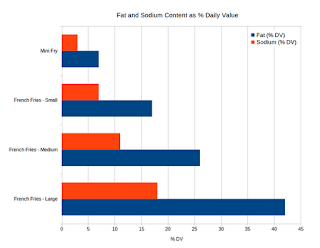 Assuming our 2000 calorie diet, that’s over half the day’s calories in one meal, as well as 71% and 54% of the recommended daily values for fat and sodium respectively. I will probably think twice in the future before I order that again.